Hi everyone, thank you for stopping by to see what is going on with My Life Planners. 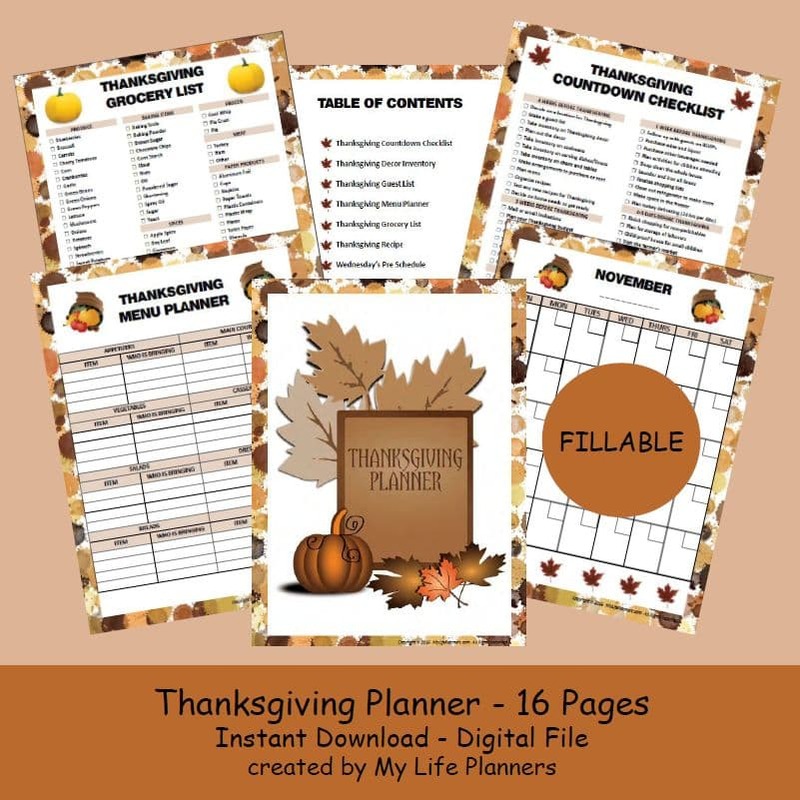 I added a Thanksgiving Planner to the Etsy shop today. Thanksgiving is a time to come together with family and friends and count our blessings. As the holidays get closer I thought it would be a good idea to start planning ahead. On Thanksgiving Day, a kitchen can become a chaotic battle field without a plan. I would like to elaborate on the process of how I create a planner. The first step is to determine a need for a planner and then brain storm details of what to include. Once the idea has come to life, the next step is to research and gather as much information on the subject as possible. I tend to use my own personal experiences when it comes to creating planners, especially when it comes to holidays. Every family has their own traditions and celebrates each holiday in different ways. Next up is designing how I want the form to flow with the information as well as including graphics to help add a personal touch. Once the form is created, the last step is making the form fillable. The whole process takes about one week or less to complete. Which may seem like a long time, but when you enjoy what you are doing it doesn’t feel like work. From my experience working in the Human Resource department, forms were one of the main elements of the job and I believe fillable forms are more practical and easier to use. Many people like myself, can type faster than they actually write. Additionally a typed form is easier to read rather than trying to decipher someone’s handwriting. If you have the Adobe Reader on your electronic device (i.e., phone, kindle, tablet, laptop) you can actually fill in the form from your device. I love having this option as you can type everything before you print. A cheap option for turning any planner into a book is to purchase a 3-ring binder. If you get sheet protectors you can keep the forms intact and looking crisp and clean. If you can plan ahead you can make the holiday more memorable and have the planner as a keepsake to remember the gathering. I feel that Thanksgiving is a time for everyone to be thankful for what we have in our lives. In honor of this holiday, I am thankful for the opportunity to have this business venture, my customers, readers, and supporters. I would like to challenge you to be thinking what you are thankful for, so that you can share with your family. May you and your family have a wonderful Thanksgiving and with the effort of planning be as smooth as pumpkin pie.